For the first installment of Fragrance Fridays, I want to introduce to you two scents I acquired over a membership based website called Rue La La. I’m not going to pretend that I know how to describe scents to great lengths. I would just like to feature fragrances that I have or wish to have and maybe their notes and what they remind me of. First one is Bulgari’s Omnia Amethyste. I have other Omnia perfumes and I like all of them. Launched in 2007, it is very fresh and girly thanks to the powdery notes. It’s composed of Green Sap, Pink Grapefruit, Iris Flower, Bulgarian Rosebud, Heliotrope, Solar Wood. No wonder I’m so drawn to it, thanks to the Bulgarian Rosebud. I got the 1.35oz bottle for $39.90 at Rue La La. 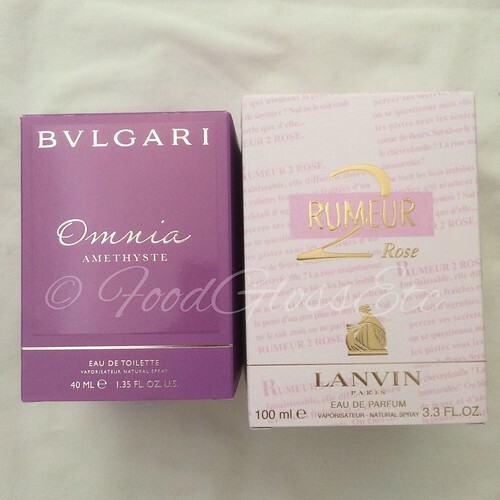 Second one is Lanvin’s Rumeur 2 Rose. Launched in 2008, it’s top notes consists of orange, lemon, bergamot and grapefruit. Middle notes consists of Muguet, White Rose, honeysuckle and Damascene fruits and base notes are those of white musk, woods and amber. This was a no-brainer purchase for me. I love the scent of rose. I don’t like all rose scents but I love this one. It’s a younger version of that old rose scent. Definitely uplifts my mood every time I smell it. And sometimes I spray it on before going to bed. I got the 3.3oz Eau de Parfum from Rue La La for $29.90. It’s no longer available at Rue La La but you cans till find these two at online retailers as well as Amazon. If you would like to have a look-see over at Rue La La, click HERE for my invite link. I get $10 credit for every new order. Thanks for dropping by and have a blast this weekend.